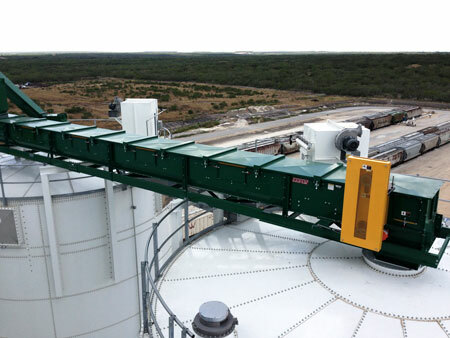 HAWLEY, MN — Rapat Corporation’s complete line of enclosed conveyors helps eliminate dust emissions, providing a solution for industries looking to meet OSHA’s updated silica-related regulations that went into effect in June 2018. Perfect for silica sand, the Rapat Series ECTR is an industrial-duty, enclosed-frame conveyor with CEMA troughing and return idlers, which provide increased employee safety in the toughest environments. Features include tool-less top covers, which can easily be removed and bolt-on bottom covers for a totally enclosed system and a greater ability to control dust. The Rapat Series ETR is a totally enclosed-frame conveyor with CEMA troughing idlers and a self-cleaning UHMW slide belt return. The ETR performs in extreme environments to ensure the capture of dust emissions. Also ideal for silica sand and other construction materials, the ETR Series features tool-less top covers and inspection doors, which make for easy maintenance. With its self-cleaning UHMW slide belt return and external bearing spool idlers, the Rapat Series RR is the optimal solution for moving a wide range of products. Designed to perform in tough environments, the RR series protects the product from weather conditions while capturing dust emissions. Each system is easily custom built to meet the needs of each specific application. Whether it’s limestone, cement or silica sand, Rapat will design and build the exact equipment required for the bulk material being handled to ensure that the job gets done right. Rapat Corporation provides engineered solutions for industrial and agricultural material handling needs. For more information visit their website at www.rapat.com .